The bus had trundled slowly from Sucre, providing us with panoramic views of the Andes which emerge stoically from the ground and extend further than the distant horizon. We were approaching Presto, and our visitors from the States who were accompanying us to the town to see the work that we do were continuing to ask about the town, its population, but more importantly, what exactly our volunteer was doing there in the library. 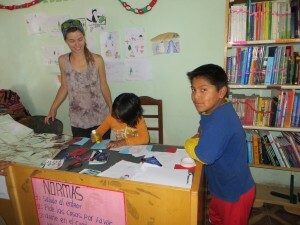 Bria, a volunteer also from the US, had been in the town for roughly two weeks, and was working as one of our Literacy Ambassadors in the library. When we arrived outside of the library, we were all excited to see one of the volunteers in action: and we weren’t disappointed. As Bria opened the library to give us a tour, a flood of local children swept into the room; all smiling faces and shy questions. They delighted in sitting with us at the tables, selecting their favourite books from the well-stocked shelves around the edge of the room and reading for us: in shaky, nervous voices to start, but their confidence grew as they became more immersed in the story that they were reading. Soon, it was time for the day’s activities: they were writing their own Christmas stories which were being bound into little books to form part of the library’s collection. It was messy and chaotic: they had already written the stories and were now putting the finishing touches to the illustrations. Colour pencils were scattered across the tables and Bria was taking charge of the gluing of bright wrapping paper to the front and back covers. It was a wonderful example of an activity encouraging the children to understand reading by acting as authors, whilst enjoying the fun of Christmas (and some very silly stories). They loved it. “They’re not normally this well behaved!” Bria confided to me, after the explosion of activity had subsided a little. “They’re great fun but they definitely need some authority sometimes!” she beamed, clearly revelling in the challenge and the adventure of working with them all. Yet she had it all under control, and we left her in the library and made our way back to Sucre. Bria is just one of the eighteen different volunteers who have worked in one of our libraries in the past six months. Every volunteer’s experience is different: a different town, a different community, different children. Yet for each, the experience is one aimed at achieving BiblioWorks’ objectives: to raise the profile of reading and literacy and to help the communities develop sustainably through these means. Every child that a volunteer works with is encouraged to see reading as of the greatest importance – and the most magical activity. 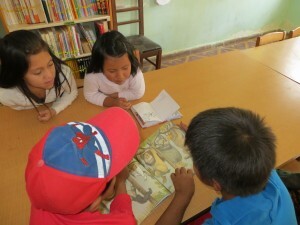 For these children, reading is integral to their futures. Our volunteers bring enthusiasm, creativity and passion to everything that they do, and it’s wonderful to see that in action and hear their fantastic stories when they leave their communities and return to Sucre. Our achievements here in Bolivia are modest yet we truly believe that what we are working towards is having an important effect on the lives of the children and families in our communities. We want each and every child with whom we work to discover a love of reading but also see it as an open door to their futures. If you are interested in finding out more about BiblioWorks, please feel free to contact volunteer@biblioworks.org. We are always on the lookout for enthusiastic and book-loving volunteers like Bria to work with us and our communities: find out about the current roles that we have here. If you would like to donate to our cause, we are currently fundraising for our Fourth Annual Festival of Reading in Sucre and would really appreciate your help. Find out about the campaign and how to donate here. Very interesting subject , appreciate it for putting it up.